Photograph shows the gravestone of actor Leslie Nielsen? Claim: Photograph shows the gravestone of actor Leslie Nielsen. 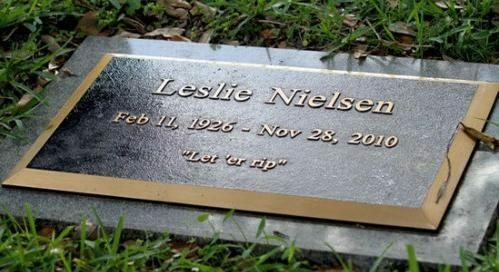 Is this really the gravestone of Leslie Nielsen? Leslie Nielsen couldn’t resist one last joke. Nielsen, the star of such comic movies as “Airplane!” and “Naked Gun,” had a low-key retirement in Fort Lauderdale before his death last fall at 84. Neilsen loved gags about gas and whoopee cushions and promised in a 1996 interview that the line would be his epitaph. Flatulence jokes from movie stars is something new for Evergreen. The Daily Mail. 3 June 2011. Orlando Sentinel. 3 June 2011.